ABBOTTSTOWN, PA 6/25/2016 – Lance Dewease was never really gone. But his performances in a limited number of appearances has amazed even the most doubting fans in 2016. Dewease started on the pole, followed outside front row starter Lucas Wolfe for the first eight laps, drove by the Zemco #1 in heavy lapped traffic on lap eight to take the lead for good in claiming the $7,000 top prize on what turned out to be opening night of the 26th Annual Pennsylvania Speedweek Saturday night at Lincoln Speedway. “It’s fun to be back,” said Dewease after scoring his 39th career Lincoln win in 17th Annual Kevin Gobrecht Memorial, “It’s been a long time since they’ve been here, and I haven’t raced here any this year.” It was the first Kreitz car win at Lincoln in ten years. Once in the lead, Dewease pulled away from the field to a four-second advantage in heavy lapped traffic when the first caution of the event came out for Cory Haas, who made contact with Doug Esh and came to a stop sideways on the back stretch. Haas changed a flat tire and rejoined the race. Fifth-starting Stevie Smith had worked his way into second for the restart, with Danny Dietrich third after a multi-lap battle with Greg Hodnett. They were still running first through third when the red flag came out for Gerard McIntyre, who rolled onto his side after contact with Esh on turn four on lap 24. Dietrich found a burst of speed over the final laps to close within two car-lengths of Dewease at the finish, just .284 seconds behind the winner. Smith settled for third, with Hodnett and Wolfe rounding out the top five. Dewease’s win in the Kevin Gobrecht Memorial gave him the early points lead in the Speedweek series (166), 15 points ahead of Danny Dietrich (151), followed by Hodnett (148), Stevie Smith (143), and Wolfe (135). Sixth through tenth were 13th-starting Brent Marks, hard charger Aaron Ott (who came from 19th), Brian Montieth, Alan Krimes, and Robbie Kendall. Fast time in time trials over the 40-car was set by Greg Hodnett with a one-lap time of 13.375-seconds (100.935 MPH). 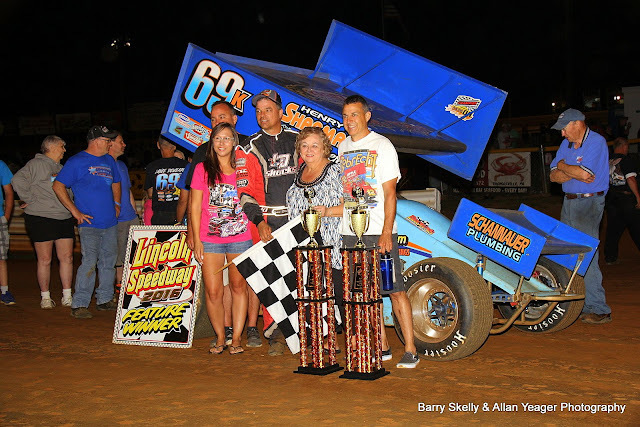 Heats for the sprints were won by Stevie Smith, Jim Siegel, Wolfe, and Krimes. Brock Zearfoss won the B-Main. Bob Stough won his heat, drew a #6 pill for the feature inversion, and came from sixth to score his fifth career Lincoln win in the Central PA Legends feature. Stough was the four different leader of the event. Scott Haudeshell led the first two laps from the pole before Lucas Montgomery took the lead on lap three. He led until Mason Chaney wrestled the lead away on lap 16. Stough caught Chaney for the top spot on a lap 19 restart and was scored the leader of the final two laps. Second through fifth were Chaney, Montgomery, Australian invader Hayden Pascoe, and Travis Perry. Heats for the 32 Legends were won by Stough, Perry, and Chaney, with Chris McKinney winning the consolation. Lincoln swings back into action next Saturday night, July 2nd, with the Nouse Signs & Graphics Summer 358 Sprint Series event, PASS/IMCA (305) Sprints, and 600 Xcel Modifieds. Racing gets underway at 7:30 PM, with gates opening at 5:30 PM. Time Trial Results - 1. 27-Greg Hodnett, 13.375-seconds (100.935 MPH); 2. 48-Danny Dietrich, 13.528; 3. 1-Lucas Wolfe, 13.610; 4. 69K-Lance Dewease, 13.629; 5. 51s-Stevie Smith, 13.727; 6. 2W-Glenndon Forsythe, 13.753; 7. 55K-Robbie Kendall, 13.778; 8. 21-Brian Montieth, 13.813; 9. 16-Gerard McIntyre, Jr., 13.816; 10. 11c-Cory Haas, 13.838; 11. 19M-Brent Marks, 13.846; 12. 23-T.J. Stutts, 13.890; 13. 15-Adam Wilt, 13.937; 14. 59-Jim Siegel, 13.943; 5. 17w-Bryan Clauson, 13.956; 16. 87-Alan Krimes, 13.964; 17. 51-Freddie Rahmer, 14.065; 18. 3z-Brock Zearfoss, 14.068; 19. 07-Doug Esh, 14.073; 20. 8-Billy Dietrich, 14.082; 21. 25-Aaron Ott, 14.093; 22. 52-Austin Hogue, 14.111; 23. 1x-Chad Trout, 14.248; 24. 94-Ryan Smith, 14.354; 25. 21t-Scott Fisher, 14.355; 26. 12b-Brad Franks, 14.362; 27. 5-Tyler Ross, 14.363; 28. 3B-Randy Baughman, 14.392; 29. 39-Anthony Macri, 14.412; 30. 2d-Chase Dietz, 14.464; 31. 1*-Tim Wagaman, 14.504; 32. 75-Frankie Herr, 14.599; 33. 74-Dwayne Gutshall, 14.611; 34. 99m-Kyle Moody, 14.622; 35. 88-Brandon Rahmer, 14.628; 36. 4-John Rudisill, 14.704; 37. 10K-Joe Kata, III, 14.799; 38. 83-Cody Fairchok, 14.934; 39. 12w-Troy Fraker, 15.234; 40. 12-Mike Bittinger, NT. Legends Consi Finish (8 Laps/6 to qualify) - 1. 3M-Chris McKinney; 2. 19L-Donnie Leiby; 3. 93-Travis McClelland; 4. 521-Scott Deemer, Sr.; 5. 41-Matt Miller; 6. 7MD-Nate Renfro; 7. 82. Shaun X; 8. 99-Wayne Welsh; 9. 8-Robert Shaw; 10. 4-Eli Dodge.